Preparing your vehicle for the winter season and knowing how to react if stranded or lost on the road are important factors to safe winter driving. Here are some tips to prepare yourself and your vehicle for winter driving. Check the battery and ignition system to assure proper starting capability. Clean and identify + and – battery terminals. Check the wipers, defroster, windshield washer fluid, and lights, especially hazard warning lights. Check the exhaust system, heater, brakes and change the oil to a winter grade oil (SAE 10W/30 weight). Check tires for adequate tread (no less than 2/32 inch). New all season or “snow tires” are recommended. Have a windshield scraper and small broom for ice and snow removal. Plan long trips carefully. Listen to the radio, call the state highway patrol or check the Internet for the latest road conditions: Yahoo Weather andIntellicast. Travel during daylight and, if possible, travel with at least one other person. Store a supply of high-energy bars and bottles of water. First aid kit with pocket knife. Extra set of mittens, socks, and a wool cap. Set of tire chains, traction mats and a small sack of sand for generating traction under wheels. Brightly colored cloth to use as a flag. 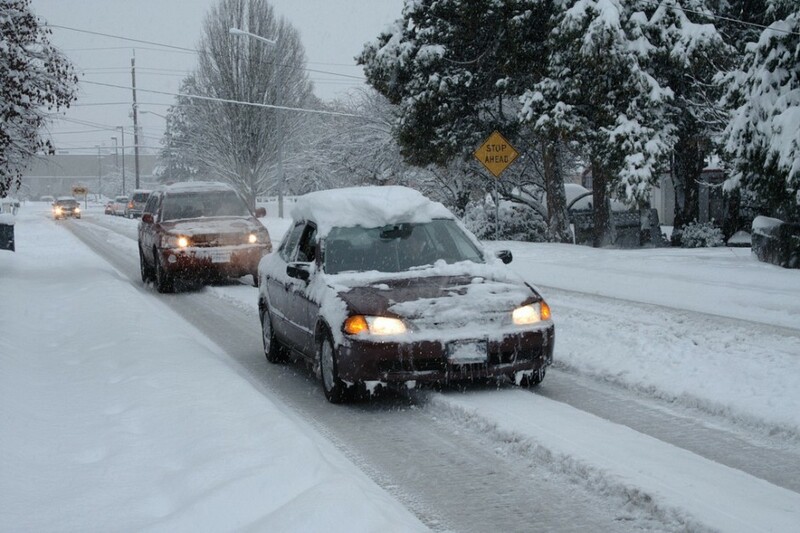 Remove all snow and ice from windows, headlights, and taillights before you drive. Make sure all movements are controlled and deliberate. Accelerate slowly to avoid loss of traction and loss of control. Move in a manner that will allow others to adjust to your actions. Anticipate actions of other drivers and DRIVE DEFENSIVELY. Bridges and overpasses freeze before other road surfaces – use caution. Remember – “Smooth and slow on ice and snow.” Beware of “black ice” when the roadway appears dry but the color of the pavement is darker and dull looking. Driving in winter conditions causes rapid mental and physical fatigue and reduces reaction times. Use greater following distances. Stopping distances on roads with ice and snow can triple over distances under normal conditions. Double or triple the 2-second count rule to create a safety buffer zone behind the vehicle in front of yours. Pass with care: passing lanes are not as well maintained as driving lanes. Brake and steer gently and deliberately. Brake carefully with short rapid application of the brakes. Turn on your low-beam headlights or fog lights whenever fog, rain or snow reduces visibility. High beams increase the glare and reduce visibility. Stay in your car. Only leave the car if help is visible within 100 yards. You may become disoriented and lost in blowing and/or drifting snow. Display a trouble sign by hanging a brightly colored cloth on the radio antenna. Turn on the car’s engine for about 10 minutes each hour. Run the heater when the car is running. Also, turn on the car’s dome light when the car is running. Beware of carbon monoxide poisoning. Keep the exhaust pipe clear of snow, and open a downwind window slightly for ventilation. Do minor exercises to keep up circulation. Clap hands and move arms and legs occasionally. Do not stay in one position for too long. If more than one person is in the car, take turns sleeping. For warmth, huddle together. Use newspapers, maps, and even the removable car mats for added insulation. Avoid overexertion. Cold weather puts an added strain on the heart. Unaccustomed exercise such as shoveling snow or pushing a car can bring on a heart attack or make other medical conditions worse. Be aware of symptoms of dehydration. Copyright © 2012 Keegan's Service Station, Inc.